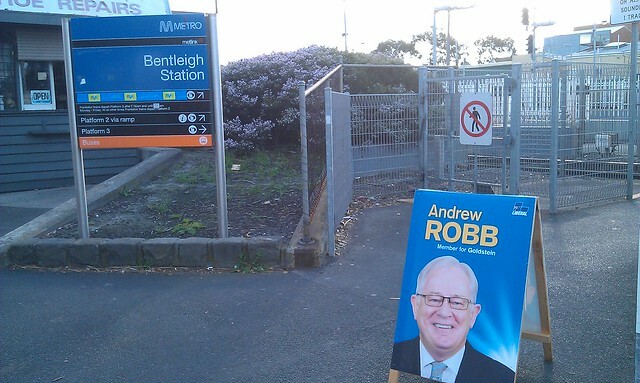 The other day, local Federal Liberal candidate (and Finance spokesman) Andrew Robb’s minions had left signs at the station, but apparently didn’t have the nerve to actually face people and try and sell their policies… which of course include refusing to fund urban public transport. Mind you, Robb’s campaigners were out at the station a few weeks ago. And while I’ve also seen the Greens and Rise Up Australia (as well as the PTUA! ), I haven’t seen hide nor hair of the Labor candidate, Daniel Guttman — given it’s a strong Liberal seat, he probably has no chance. Yesterday it became clear that not only will the Coalition not fund public transport if they get into power, they will actually take away already funded money. Their funding of public transport won’t be zero, it’ll be negative. 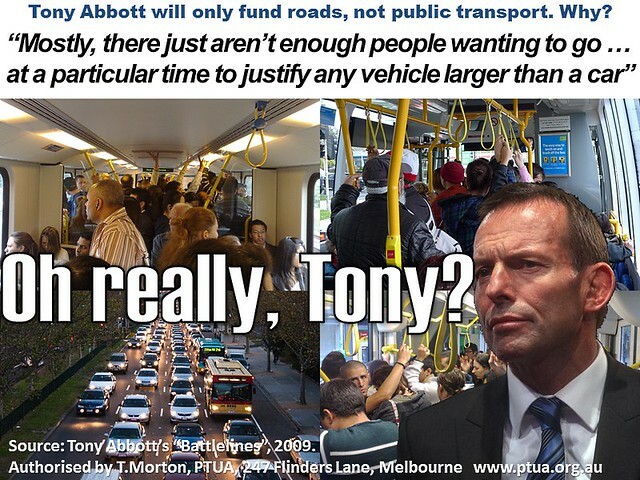 Why is Tony Abbott’s Coalition so against public transport? His book Battlelines indicates he genuinely doesn’t believe it can work in Australian cities. Along with the messed-up internet filter policy, the hobbled NBN, the scrapping of the carbon price, embracing fossil fuels and ignoring renewables, the forthcoming Abbottalypse is looking like giving us the most regressive government in quite some time. What’s staggering to me is that Labor haven’t managed to articulate this to the electorate. They ramble on about trust (which after their own problems of the last few years, they are not well-endowed with) instead of making the most of the policy divide, which if explained, would show many of Labor’s as largely progressive compared to the Coalition’s mostly backward-looking ideas. There are actually sound rational conservative arguments in favour of public transport, particularly around economic development, as well as encouraging competition between modes rather than dominance of roads and their dependence on foreign oil. What a shame in Australia we don’t have progressive, rational, thinking conservatives like in Europe… well, at least, not in power at the federal level. Most people use cars to get around so Tony thinks he’s on a winner. Just as well the footy’s on TV tomorrow night so I won’t have to watch the election coverage. Genuinely depressed. Currently on a packed, delayed train into the city. Perhaps all train users could drive to the city one day as a protest to show how much we matter. Well Daniel Liberal PT supporters do exist. I have been involved in the Liberal party in the past and know quite a few who still are. Yes the liberal party has a few people who think”PT is socialist” but I’d say they are in the minority. I’d say most members are agnostic about the issue and will support PR when good reasons are given. The road lobby is very good at capturing this group with nice stories of helping the economy. Where is the PT lobby on this? I personally know of a few informed liberals who privately think the roads only approach is a poor use of money and not in the best interests of the economy. You are right that there are a lot of economic arguments for public transport upgrades. Lobbyists should emphasize these as for a conservative audience this is way more compelling than arguments about lefty stuff like reduced greenhouse gasses and other touchy feely stuff. Is it not a coincidence that the wealthiest cities in the world also have the best PT? Why isn’t it emphasized about how critical PT is for the success of the Melbourne CBD? As someone who takes economic responsibly very seriously I am dismayed at the push to get taxpayers to underwrite the East West Link PPP -it makes the desal deal look like a good use of taxpayer dollars! Speaking of Andrew Robb, he was on the ABC this morning specifically talking to this point. Funding for major roads would go from 50/50 federal/state to the traditional 80/20, relieving state governments to fund public transport. In my mind its not ideal, but it beats the gloomy scenario painted by the above. I remember the PTUA campaigning against the Howard government’s lack of funding for urban public transport- I recall Howard’s argument back then was specifically what is being used now- its up to the states. I for one desperately hope the Metro tunnel gets up- it’ll only do so with a major commitment from the state government. I sense the refusal of the (soon to be…late face it) federal government has more to do with the dire financial situation it confronts than any ideological hatred of public transport. With East-West seemingly a given, lets hope the billions the feds will pour into roads will allow more state investment in PT- I’m an early optimist! When the Coalition released their costings yesterday I was somewhat dismayed that they plan to take 4.5 billion dollars of foreign aid to divert to “infrastructure” projects. 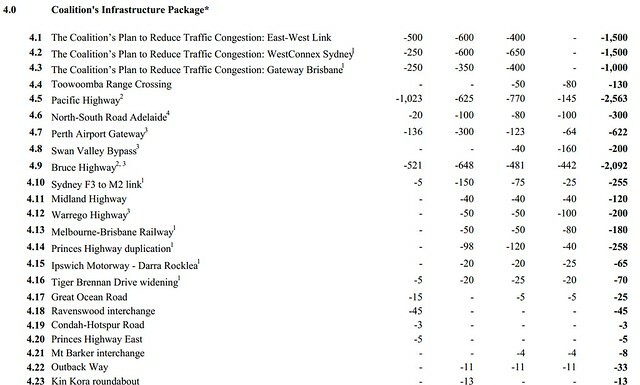 My dismay turned to astonishment when I went into the costings document to find out what these “much needed” infrastructure projects are, and found that apparently Tony Abbott has a special kind of thesaurus where “infrastructure” is a synonym for “roads”, as the infrastructure projects consist of 30 road/bridge projects, minus 4 rail projects, and no dams ,or shipping ports or airports or *anything* else other than roads. I guess that explains why he’s also so keen on re-instating vehicle FBT arrangements and scrapping the carbon tax, to ensure that there are plenty of cars powered by cheap petrol to fill all these roads he wants to build. The Liberal backers are more concerned about creating statutory monopolies and lucrative concessions, than they are about actual free enterprise and competition. It is a return to the stagnant economics of the 18th century. Someone makes money off toll roads. Not sure who, it certainly doesn’t seem to be the shareholders in them. Nobody makes money off public transport.